The Vanderbilt Arboretum has been an integral part of the university since its beginnings in the 1870’s. 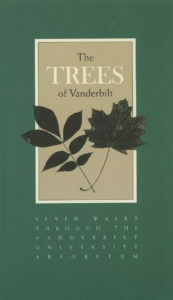 In 1994, The Trees of Vanderbilt was published as the first work to systematically document the history of trees at the university and to provide accounts of particular trees that could be visited on seven walks around campus. For many years this book was sold in the campus bookstore and was a reference for those who enjoyed exploring the trees of the arboretum. Unfortunately, since 1994 a number of the trees listed in the book have died or been cut down. However, many of the trees are still present and can be enjoyed by visitors. This online version of the book provides current information about the status of many of the trees listed in the book. The bottom of a page notes whether the tree still exists and in many cases clicking on the page image will take you to a web page about that tree. If you are reading this on a GPS-enabled portable device, the Find Me button on the tree’s page can be used to locate the tree using your device’s map application. It is still possible to take the seven walks listed in the book if one ignores the trees that are now missing. The arboretum website also provides additional online tree tours. This book is copyright 1994 by Vanderbilt University and was scanned and put online with permission. Please sent your comments about this website to Steve Baskauf.